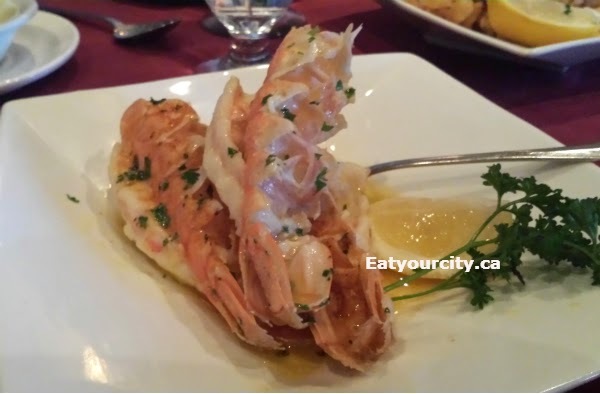 Eat Your City: Villa Maria Italian Ristorante, Calgary, AB - Taste of Italy and you feel like famiglia! Food Reviews from fellow foodies passionate about food food fooooood! Villa Maria Italian Ristorante, Calgary, AB - Taste of Italy and you feel like famiglia! Posted by For a recent birthday, we headed to Villa Maria Italian Ristorante as we had heard not only their food was a taste of Italy, the service was phenomenal and you get treated like family... and we weren't disappointed! This little gem is tucked away on 17th Ave, and they even have free parking *gasp* in the back of the restaurant! (I had to do a double take when I heard they had parking. On 17th Ave! We were greeted (as was anyone) coming into the restaurant by Danny, the owner of Villa Maria, who seems to know all the regulars by name. Be prepared to laugh, joke and get hugged by Danny.. we happened to come on his birthday and the entire restaurant burst into song for him. The dimly lit dining room has red tableclothes, white linen napkins which with the welcoming atmosphere, was reminiscent of heading to a friend's place for dinner. Our waitress was informative, friendly and tagged teamed with Danny and other waitstaff for one of the best service experiences we've had in Calgary in a while. Water and vino were refilled before we even realized they needed to be, and everything served was always checked promptly upon by Danny... he definitely wants folks to walk away with a happy experience! We learned the restaurant is named after his beautiful wife - Maria. On to the food! I didn't get a chance to take pics of all the food as we were a large table, just whatever was within reach.. next time! I adore bruschetta, and was pleasantly surprised Danny served everyone bruschetta along with the usual bread and butter on the house. 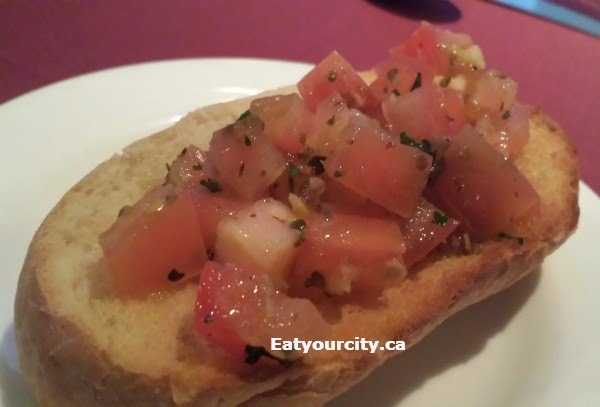 While its sadly not the season for tomatos in Calgary, the chef somehow managed to create a wonderful burst of tomato-y sweetness and garlicy goodness in their bruschetta... nom! 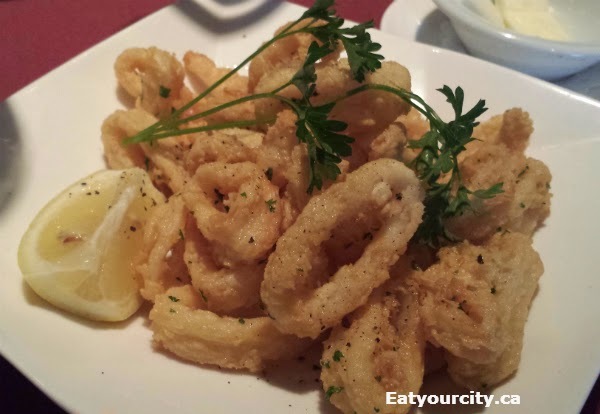 The deep fried calamari, with a home made tomato sauce had a delightfully crisp and light batter and perfectly cooked tender calamari within. I had no idea it came with a tomato sauce and did't try it as the well seasoned calamari stood well enough on its own. We had ordered a few Mussels in a garlic white wine cream sauce to share as well, and rather than a big bowl of mussels you normally see in other Italian restaurants, the mussels were on the half shell and arranged on a plate floating in lots of garlicy rich creamy sauce for easy eating. A bunch of us went with the Linguini Fruitti di Mare - Linguini with assorted seafood in a tomato sauce. 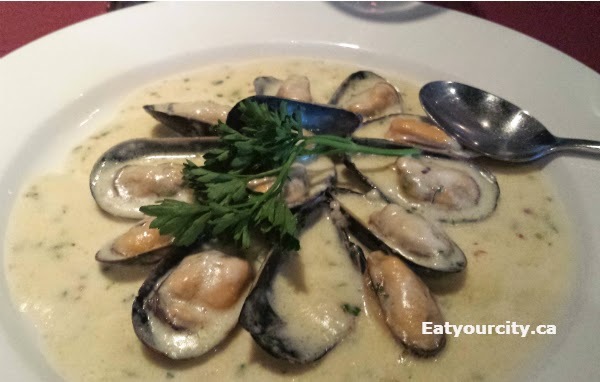 The sauce is lovely, smooth, sweet and just a hint of acidity that works well with the seafood in the dish. There is a surprising amount of scallops, calamari, shrimp, clams and mussels hidden within this pasta.. despite sharing most of the pasta, I was full by the time I worked through half the plate! My fiancée went with the Lobster Ravioli in a butter white wine lobster reduction, and he wasn't disappointed... he almost had to order another plate as everyone snuck so many bites off this plate hahaha! The ravioli was packed full of chunks of lobster meat, and the incredible sauce... every last drop was sopped up with bread and not a drop was wasted. The rest of our group went with the special of the night - Veal scaloppini with mussels, shrimp, mustard cream sauce with choice of vegetables and pasta. The veal was thin and tender. It was a touch overcooked, but that may have been me taking up time to snap some pics. The mustard cream is velvety smooth with just enough mustard to pack a tasty punch of flavor. We unfortunately ran out of room to try their tiramisu... so we rolled out the door to head home to have birthday cake! Overall, a great little hidden gem - head to this homestyle Italian restaurant for big portions of pasta, delicious Italian fare and lots of Italian love where Danny remembers your name and treats you like family! Next time I'm gonna remember to bring the SLR instead of using my phone to take pictures!! Baking brie – making baked brie with little brie baker! Kam Do Bakery Richmond, Vancouver BC – best sweetheart cake, or “old wife cake” Lou Po Beng pastries! Copyright: Eat Your City 2010-12. Powered by Blogger.